IMPRESUB develops in-house technology for new marine applications and innovative solutions combined with time proven techniques. The company provides support for the management and execution of offshore and onshore projects within a wide range of sectors, including oil and gas, cable and communications, ports and marine infrastructures, civil engineering, design, and environment. IMPRESUB has developed and applied in-house innovative concepts into the design and fabrication of post-trenching machines (PTM). 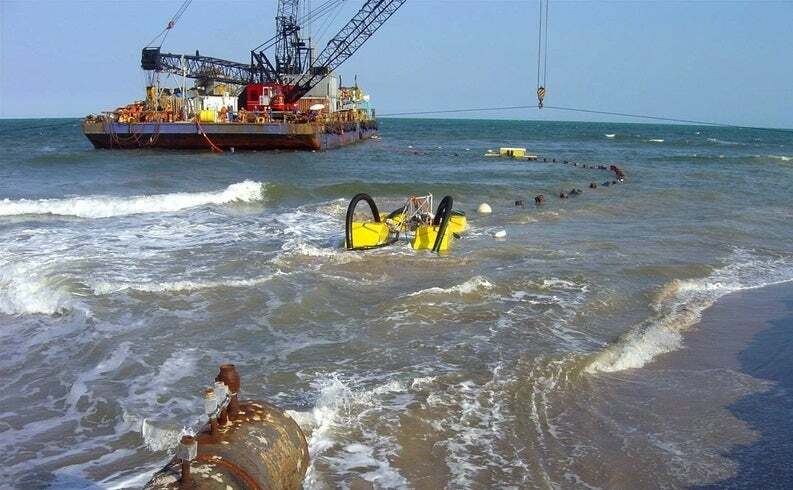 This includes specialised subsea trenching equipment to the burying of different sizes of pipeline in shallow and deep water, in various sea bottom soil conditions. Specific tasks include engineering and design, development and improvement of trenching new technology, installation support for offshore structures, stabilisation and trenching of subsea pipelines and cables, protection works on cables and pipes. IMPRESUB’s NDT division provides a large range of inspection solutions, managing a worldwide network of partners and aiming to provide efficiently and professional service, with a range of ultimate benefits secured for the company. The subsea pulsed eddy current (PEC) system is the core business of inspection service, as it is capable of detecting pipeline corrosion status without coating removal, pre-treating or deep cleaning. IMPRESUB offers pulsed eddy current equipment for under and above water assets. IMPRESUB operates state-of-the-art survey equipment, including high-resolution acquisition systems, swath bathymetry, sub-bottom profiler, side-scan sonar and complete on-board post processing capabilities. The company offers pre-drilling site surveys for shallow gas detection, pipeline and cable route or as-laid surveys, platform site surveys and high-resolution seismic exploration. This includes the processing of hydrographical geophysical and oceanographic data, as well as the creation of high-quality charts and interpretation services using the latest software and hardware. IMPRESUB supplies a wide range of ROV vessels, ranging from Class 1 Visual to Class 4 Work, capable of operating in water depths up to 3,000m. The company has performed more than 30,000h of ROV operations such as structure inspections, metrology, installation support and monitoring, trenching assistance, visual inspections, pipelines, fully instrumented surveys, and search-and-salvage operations support, drilling activities support assistance and monitoring, and pipelines touchdown monitoring. IMPRESUB consistently invests in providing clients with modern diving technology and a wide range of diving support systems for air and mixed gas saturation. The company also offers air system spreads and saturation units for teams of between four and 12. International Marine Contractors Association (IMCA) compliant, a number of systems are certified by DNV, rated for diving intervention operations at 300m. IMPRESUB supplies specialised technology for underwater research, inspection, and salvage of sunken vessels. Based on its successful salvage projects, IMPRESUB performs recovery and salvage operations, including survey and visual inspection, salvage planning, engineering and recovery operations, search and clearance of ordinances and hazardous materials. Several projects have been successfully completed include marina and harbour maintenance, breakwater construction, dam maintenance and basin restoration, and river bridge foundation inspections. IMPRESUB offers customers qualified project management and consultancy, always granting the application of new and updated products, services and technology, with a team of specialists performing dam structural inspections, repair, risk analysis, area environmental and security plan assessment. IMPRESUB is involved in marine science and environmental studies, oceanographic investigation, underwater dynamic phenomena, biology, fish stocks assessments, habitat and beach restoration, and stabilisation activities. The company is also licensed for the application of integrated system (RSA) for coastal erosion monitoring. IMPRESUB’s research and development (R&D) department designs and develops tool prototypes for dedicated engineering solutions, for specific offshore applications such as cone penetrometer test (CPT) machines, and a combined CPT with a rotary corer for rock and consolidated formation applications. IMPRESUB aims to provide clients with secure, professional and cost-effective solutions for their marine and subsea worldwide projects. The company has performed operations through well-equipped operating bases and branches in the Mediterranean, North and West Africa, the Middle East, and Central and South America. Impresub's team of highly skilled engineers is committed to pushing the boundaries of technological research and development within its field of operation.